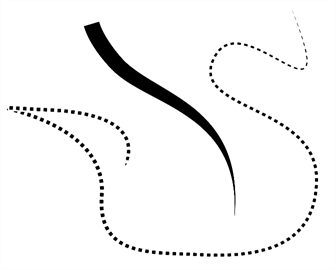 A thickness stencil is a preset that already set with specific properties. There are two types of thickness stencils. A Regular thickness stencils allow you to set the size and smoothing of the line or shape. As you draw, the thickness of the line varies according the amount of pressure you use with a pen and tablet. 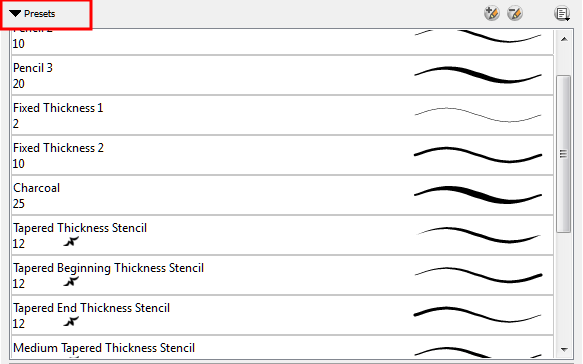 You can access thickness stencils from the list of preset on the Tool Properties view, or create your own. Using the drop-down menu, you can select an existing thickness stencil. 1. 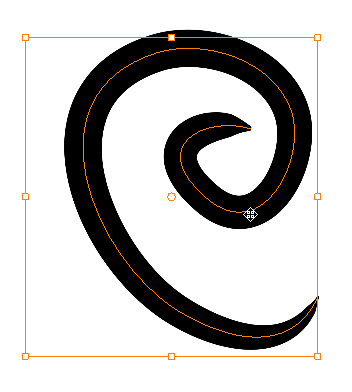 In the Tools toolbar, select the Pencil , Line , Ellipse , or Rectangle tool. 2. In the Tool Properties view, in the Presets drop-down menu, select the thickness stencil you want to use. 3. In the Drawing or Camera view, draw your pencil line or shape. 2. In the Tool Properties view, click the New Pencil or New Brush button. 3. Enter a name for your new pencil thickness stencil and click OK.
4. Start drawing in the Camera or Drawing view. 1. In the Tools toolbar, select the Select tool. 2. In the Camera view, select the pencil line or shape you want to take the style from. 3. In the Tool Properties view, click the New Preset button. A new thickness stencil is added to the end of the list in the Presets drop-down menu. 4. In the Presets drop-down menu, select your new thickness stencil and click on a line or shape in the Camera view to apply the thickness stencil you created. 2. In the Presets drop-down menu, select the thickness stencil you want to rename. 3. From the Brush menu, select Rename Pencil or Rename Brush, depending on the tool you selected. 4. In the Name field, type in a name for the selected thickness stencil you are renaming. 1. In the Tools toolbar, select the Pencil tool. 2. In the Presets drop-down menu, select the thickness stencil to delete. 3. Click the Delete Preset button. To avoid modifying your thickness stencil inadvertently, you can lock them by enabling the Lock Pen option. 2. In the Camera or Drawing view, select the pencil line or shape on which you want to apply a style. 3. In the Tool Properties view, select the style you want to apply from the Presets list.